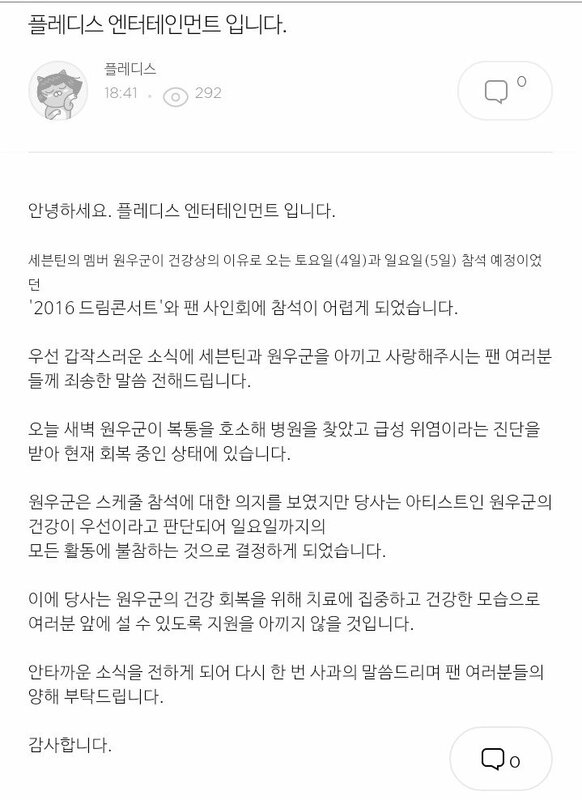 Due to Wonwoo’s health he will be unable to participate in the scheduled Dream Concert and fan signs scheduled for the 4th and 5th. We are sorry for this sudden announcement and regret to inform fans who love SEVENTEEN and Wonwoo. Early this morning Wonwoo was rushed to the hospital after saying he had severe pain in his stomach. He was diagnosed with acute gastritis and he is currently recovering. Wonwoo was adamant that he fulfill his schedules, but the agency has decided to prioritize his health and we have decided that he take a rest until Sunday. We will make sure he recovers fully and focus on making sure that he comes back healthy to his fans. We are once again sorry to bring you such sad news and hope the fans will understand.